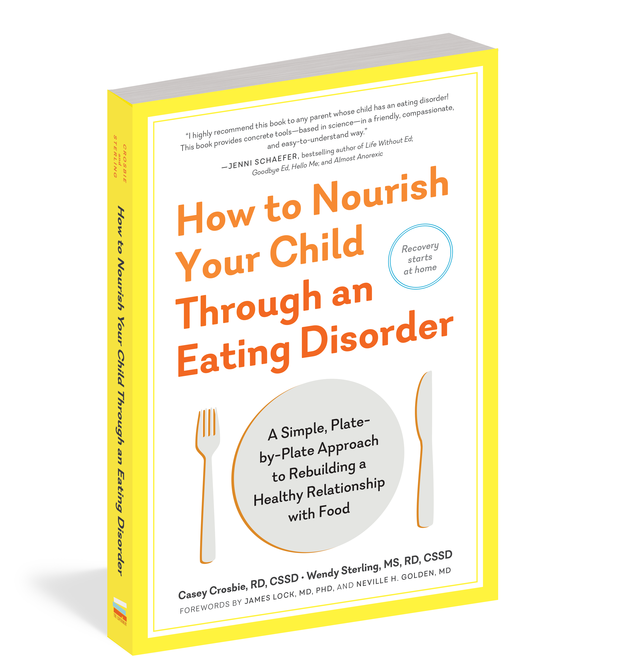 “How to Nourish Your Child Through an Eating Disorder: A Simple, Plate-by-Plate Approach to Rebuilding a Healthy Relationship with Food,” introduces our innovative new approach, the Plate-by-Plate Approach, geared for parents whose child is struggling with an eating disorder. Using just a plate, parents are taught how to renourish their child, without measuring or counting calories. We offer background information on eating disorder diagnoses, family-based treatment, medical management, how to talk about weight/dieting (hint: don’t), and how to rebuild one’s relationship with food. We have two expert forewords written by James Lock, MD, PhD and Neville H. Golden, MD from Stanford. Casey Crosbie, RD, CSSD, is a specialist in adolescent eating disorders and currently serves as program director at the Healthy Teen Project, a partial hospitalization and intensive outpatient program for ado- lescents with eating disorders in Los Altos, California. She previously served as lead dietitian for the Lucile Packard Children’s Hospital (LPCH) Comprehensive Care Program for Eating Disorders at Stanford. Casey was published in Nutrition in Clinical Practice (2012) and in the Journal of Adolescent Health (2013) for research focusing on refeed- ing syndrome as well as increased caloric intake and reduced length of hospitalization in adolescents with eating disorders. Casey received her BS in food science and nutrition from California Polytechnic State University, San Luis Obispo, and completed her dietetic internship at UC Davis Medical Center to earn her RD. Wendy Sterling, MS, RD, CSSD, is an expert in adolescent nutrition, with a specialty in eating disorders and sports nutrition. Wendy is the team nutritionist for the Oakland Athletics and has previously consulted for the New York Jets and Golden State Warriors. Wendy has worked in the Eating Disorders Center at Cohen Children’s Medical Center of New York and the Healthy Teen Project in Los Altos, California. She has conducted research on amenorrhea, metabolism, and osteoporosis which has been published in the International Journal of Eating Disorders and the Journal of Adolescent Health. Wendy is the coauthor of No Weigh!! A Teen’s Guide to Positive Body Image, Food, and Emotional Wisdom. She received a BS in nutrition/dietetics from Cornell University and her MS/RD from Teachers College, Columbia University.